We all know, managing school is extremely complicated and requires a lot of paperwork. 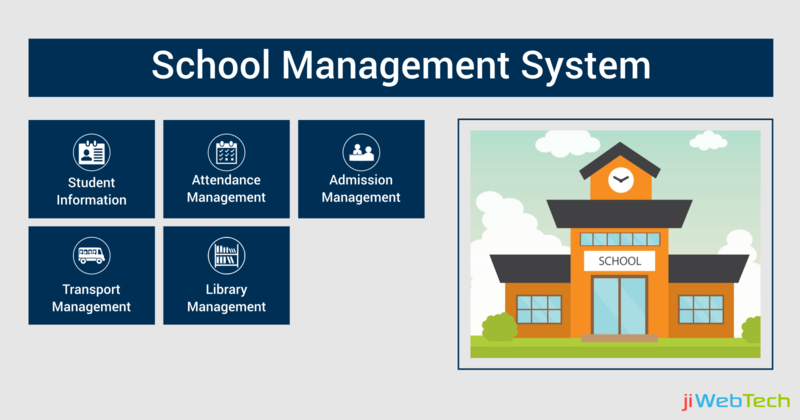 And, school management needs to manage their data properly and perform all school-related functions in an efficient manner. It cannot be done with only paper records anymore. Therefore, it is important to introduce some technical measures that will help staff members manage their workloads. Today's school needs modern information systems allowing managing all operations of school in one place. One stop solution that helps in smooth functioning of a school is jiSchoolERP. This software proves to be an effective way of managing all the school activities. Student Information: Attendance, homework, discipline, grades, and achievements. Almost every single information regarding the students can be accessed easily using our jiSchoolERP. Teachers can use the student database to avail basic information of students like grades, fees, reports, address, information regarding parents and siblings etc. In addition to this, details regarding the students’ medical history, accounts, billing etc. are also added by the administration. It also includes a large number of filters for advanced search functionality to look for specific type of students. Attendance Management: Attendance management is a very significant school administrative task that requires a huge amount of time for teachers to do that at the beginning of each class. It becomes difficult for teachers to manage the whole process of taking attendance and recording them accurately. Marking attendance in grids is very hard and errors can occur very easily. However, attendance management is no longer a burden on jiSchoolERP. It allows recording attendance of each student in a single click. You can manage attendance of your students without any errors using jiSchoolERP. Admission Management: Avoid keeping bundles of files when you can save all the data in a system. jiSchoolERP helps you access any data quickly whenever required. It has the capability to manage the registration and admission process of every single student smoothly. It removes the difficulties caused by human errors and treats the new and old students differently based on the information provided. Transport Management: jiSchoolERP also has the facility to manage school transportation effectively. With this, you can keep track of each student’s route change history. They also display information such as students who have opted for school transportation without routes assigned to them. It makes sure whether a student is present on the bus ensuring his/her safety. Library Management: jiSchoolERP is an effective solution to turn the school library management simple and quick. It has features to search, issue and return books. It supports scanning and barcode capability to automate your library. It also includes reports of library members, daily issue register and much more. If you are running a school and handling the database of a huge number of students, you definitely require this perfect solution; jiSchoolERP. Talk to our team today at sales@jiwebtech.com to get jiSchoolERP demo installed for your school, college or university.